Six years ago Sam Cawthorn was pronounced dead on the scene of a major car accident. Now he is on stage at the Brisbane Convention Centre, talking with some of the world’s most promising minds about his experiences overcoming adversity. You could say Sam bounced back from the dead, but he prefers to call it bouncing forward. “Things will never be the same again. Why would you want to go back to where you started? You need to keep moving forward,” the motivational speaker said. 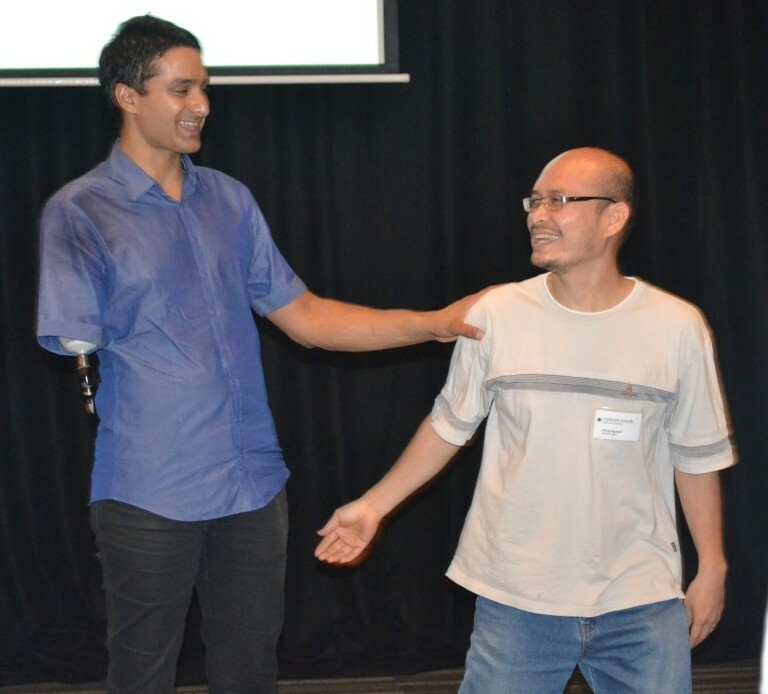 And that’s just what the former Young Australian of the Year did when he woke up from his six-day coma, faced with five months of gruelling rehabilitation — an incredible journey of recovery that eventually led him to his recent talk with Brisbane’s Endeavour Award holders. Part of Sam’s recovery was learning acceptance. He was told he’d fallen asleep at the wheel and had hit with an oncoming truck. When paramedics arrived, Sam had no pulse, two collapsed lungs, a shattered leg and numerous broken ribs. He also had no right arm: it had been ripped off and thrown 25 metres from the wreckage. Sam was in hospital for the next five months, but he was determined to regain the mobility doctors said he’d never have again. With no dominant arm and a leg filled with more metal than bone, Sam’s chances for a normal life were abysmal. “The doctors told me I’d never walk again, never play the guitar again, that I’d spend the rest of my life in a wheelchair,” Sam said. But Sam was determined. And in an awe-inspiring recovery, he once again learned to walk and to play the guitar. Sam’s faster-than-expected recovery can partly be attributed to his sense of humour. He fondly recalled his favourite arm-less incident, where he pranked unsuspecting then Prime Minister Kevin Rudd by loosening his prosthetic hand so that it fell off in Mr Rudd’s during their handshake. But Sam’s talk was about more than the jokes he had up his sleeve. He focused on how some of the world’s best creative work came from people who’d hit rock bottom. Sam’s presentation was part of a workshop and networking event for Endeavour Award holders. The awards, funded by the Australian government, give opportunities for students from the Asia-Pacific, Middle East, Europe and the Americas to undertake study, research and professional development in Australia. Photo: Sam Cawthorn with award recipient Dong Truong Nguyen.